My son is obsessed with pirates at the moment. He loves "Jake and the Neverland Pirates" on the Disney channel, and has even taken to saying "ay ay Mummy" when I ask him to do something! He calls money "gold dablooms" and calls his friends "mi hearties". He's really entered into the spirit of it! 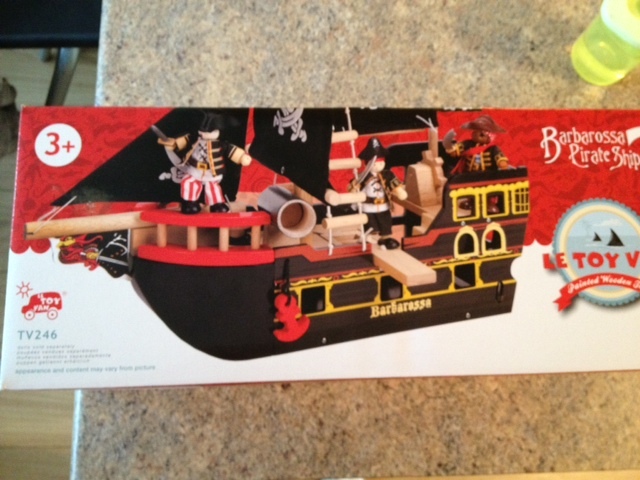 Therefore we were all pretty thrilled to be sent an exquisite pirate ship from super duper website Dolls Houses this week, which is called Le Toy Van Barbarossa. This is the box, and was a good sign of things to come! 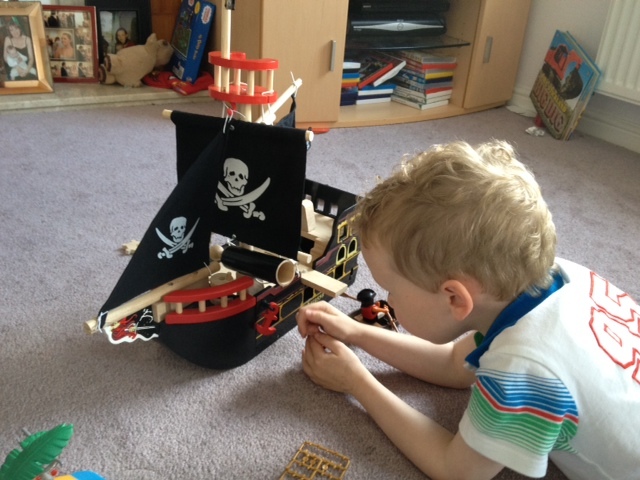 When we opened the box, I discovered that quite a lot of the ship actually had to be built, but all the parts were included and actually my son and I enjoyed putting it together as a team. 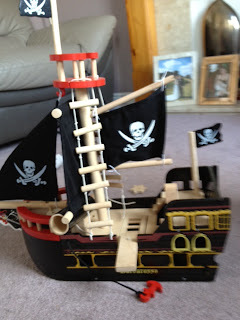 The ship is much better quality than you normally get for kids toys, it's made from painted wood and it's excellent quality. The designer of the toy obviously knows how little boys' minds work as there are loads of nooks and crannies for them to hide things in, trap doors, and even a plank to walk! He loves the fact there is an anchor as he likes winches and winding things. He also likes the ladders that lead to the birds nest (is that what it's called?). The sails are actually made from genuine material which is unusual for toys these days where everything seems to be plastic. All in all, we're over the moon with our new toy. It's something we will keep forever and is the kind of thing you might keep and pass onto the grandchildren as it's made from such good quality wood. The only thing I wasn't expecting was the fact that no pirates come with it but you can buy these from the Dolls Houses website. Thanks Dollshouses, we love our new pirate ship! This item was given to us in return for a review, however it is my unbiased opinion and is really cool! That looks great - I want one!